The organization’s partners and contributors were treated to inspirational speeches by Dan Olofsson, Star for Life founder, and Alf Svensson, famous Swedish politician and Member of the European Parliament from 2009-2014. 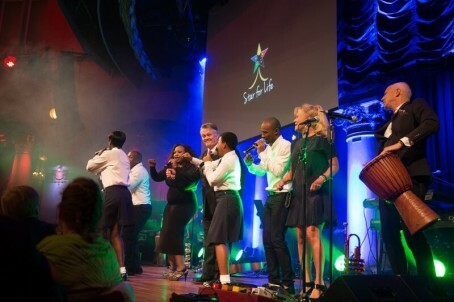 Performances from Carola, Gunhild Carling and Star Choir of South Africa created an amazing atmosphere for this evening. Sigma Technology was represented by Carl Vikingsson, Daniel Nussdorf, Daniel Thysell and György Nagy. Our company has been Star for Life’s partner since 2014, when we took over the responsibility for Mmemezi High School in KwaZulu-Natal province. This autumn we will nominate ten school leavers to receive the scholarship for their higher studies. In 2016 our plan is to add two primary schools to Sigma Technology’s sustainability program. “We are inspired by the success and deeds of Star for Life organization. Since 2006, the program has supported over 300 000 students in South Africa and Namibia. Star for Life creates a better tomorrow for these young kids, and we are more than proud to join them in this noble mission,” shares Carl Vikingsson, CEO at Sigma Technology Group.